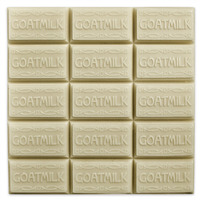 Our Basic Goat Milk Melt and Pour Soap Base is white and contains real goat milk, thought to be pampering to the skin. The 24 lb. big block is ideal for larger projects, as it will make (96) 4 oz. bars of soap. Soap comes in a blue bag with twist tie and corrugate box. A single block measures 13 x 11.5 x 6 inches. COMMENTS: I have used many melt and pours and this one is the best so far! I love how evenly it melts and there is never any mess to clean up. "This is the best base soap!" COMMENTS: I use this for bar soaps, as well as molded shapes. I have numerous repeat customers who love that this does not dry out skin! I have ordered many times, and will continue! "By far the best out there "
COMMENTS: I love this soap. Just hate cutting it up.. but I can't beat the price!! COMMENTS: I loved this M&P soap! It works very well and it is also a very good price. It is also pretty moisturizing which my customers loved. COMMENTS: Great product. Use it often!! "Crafters Choice™ Basic Goat Milk MP Soap Base - 24"
COMMENTS: Very popular with my customers. Holds the color and scent well. Will purchase this product again. COMMENTS: I have been selling Goats Milk Soap for a while now. And this by far is the best Goats Milk Soap Base that I have found. It is a long lasting soap and doesn't goop and I really love that about this soap base. My customers love how this soap leaves there skin feeling, and are buying on a regular basis. I am now selling 3 pound loafs and are selling really well. Thank You for a Great Product!!!! COMMENTS: I have been trying a few different melt & pour soap bases from various sources. This one is my favorite, as it is easily cut through, is super soft & easy to melt. I am impressed with the quality for the price. "Goats milk melt and pour"
COMMENTS: I love this melt and pour! Very creamy, lathers well. Will buy again. COMMENTS: Can't beat the price for such a good quality goats milk soap. if you are afraid to try your hand at milky cold process soap give this a try.
" Basic Goat Milk MP Soap Base"
COMMENTS: Love this Goats Milk Soap! The Best! "Great base that works for multiple soaps"
COMMENTS: I used this melt and pour with several different essential oils and fragrances. I have been really pleased with how smooth it melts and how easily it accepts my add-ins, colors, and scents. I think for the price it is a very good buy. I love the amount of lather and it feels silky on the skin. Good value and quality. Cuts easily as well. COMMENTS: My customers love this soap! They use it once, and they are hooked. I use this for my wholesale customers that want visually identical soaps, vs CP/HP that may vary from bar to bar. COMMENTS: I have always looked at the bases but thought they were a little spendy so when the 25% sale on bases happened I took a chance and tried them. I must say very nice base and great quality soap and with what I save on free shipping it makes the soap cheaper than most. Definitely will be buying again. "Melt and Pour Goat Milk Soap Base"
COMMENTS: I love this base. I've been ordering for about 12 years. Soap is always wonderful, creamy, lathers so well and gentle enough for all skin types. I would like to know what oils/ fats are in this soap, so that I can use the common names for my labels. I thought it has coconut oil in it, but I'm not sure. COMMENTS: This base is exactly what I wanted. It is rich and creamy and is very easy to work with. I was very surprised on how easy it was to work with the 24 pound block. COMMENTS: I like this base for the simple value of the product. Also, it melts quickly. The only downfall to the 24 lb block is the need to weigh it out when cutting, but much more cost effective if you produce a large amount of soap. COMMENTS: Very easy to work with! I've used this to make soap for my family an friends! It's amazing! "Basic Goat Milk MP Soap Base - 24 lb Block"
COMMENTS: To be honest, I ordered the Basic Goat Milk in error. I usually order the Premium however I am pleasantly surprised by the quality of the Basic. Has a great lather and I really don't think my customers will notice! COMMENTS: Best goat's milk base out there on the market! COMMENTS: I really like this goats milk base for my soaps. It melts quickly and evenly. This soap base takes well to both liquid and mica soap colorant. I found that I do not need to go overboard with any fragrances either. This soap has a light lather so you may want to add additional "bubbles". I plan to continue to use this soap base for my products. "SEARCH FOR THE PERFECT GOAT'S MILK M&P STOPS HERE!" COMMENTS: Finally! My search for the perfect melt & pour goat's milk has ended...here with this wonderful product! I will never buy another brand. Absolutely the creamiest and silkiest M&P out there! I am 100% satisfied! Melts at a very low point. COMMENTS: Best soap base I have found and the price beats all hands down. COMMENTS: I absolutely love this soap for my scrubs but I hate the block. Bought it because it was a little cheaper but not worth the trouble. COMMENTS: Am I having fun! I order this product for the first time. I absolutely love that how it saves me time and I can have fun designing the soaps. Yet to see, how long this soap last compare to CP soap. • Saves time. Easy to work with and mold. COMMENTS: I cant keep this base instock, customers adore it!! So easy to use, and a perfect white to add color to! COMMENTS: So easy to use, blends well with the colors I have used (liquid color), and holds fragrance well. It is one of my go-to MP bases for most of the body care kits I put together. It comes out of molds quite easily and is also fairly easy to cut. The 24 lb. block size is not too difficult to work with. I simply slice off pieces until I get the amount I need. I do struggle sometimes with the packaging, as the plastic bag is usually stuck in the soap base in a few places. But I have always been able to work around it. COMMENTS: This Melt & Pour Base melts like a breeze. It take Liquid color very well and stays true to color. "Great lather and low sweat." COMMENTS: I have made a lot of bars of soap with this base and customers keep coming back for more. Many people comment on how much they love the lather. I have also found that it doesn't sweat much. I always make sure I have this soap base on hand. COMMENTS: I have used other goats milk bases from other companies however this one is my favorite for the price. I started buying it in the 2 lb. tubs but quickly moved to buying the bigger 24 lb. block because it saves me money and the customers all love the soaps that I make with it. This goat's milk is the main base that I work with, it holds scent pretty well and I use color blocks regularly to color it. COMMENTS: Goat milk soap base is my favorite. I've tried other brands of goats milk base and I have to say that CC is THE best! When you get it, it is a little intimidating to cut as it comes in one big block. But eventually you'll get the hand of cutting it. Buying bulk works if you have a huge project and saves you money for smaller projects. It's very creamy, holds colors and fragrances well and has great moisturizing qualities. It's a big seller and I will continue to buy! COMMENTS: This base has slightly less foaming ability than the premium base. I have sold a lot of this base and customers return for more. The base holds color well and requires about the same amount of fragrance or essential oils. I will purchase again. COMMENTS: Every customer that purchases soaps made of this will tell you it leaves their skin nice and soft!!!! This is a great product to have in your line. COMMENTS: It is great if you have a big project or a sale coming up. I hate the waste of all the plastic containers with ordering in a 2 lb tray. Quality soap loved by my customers. COMMENTS: Folks like using a goat milk product. Provides a nice, soft lather. COMMENTS: Love Love Love this soap base but what is up with the plastic bag stuck to it (not a little but alot of the soap). Never had this before. But on the bright side it gives me a work out on my arms. • the plastic bag stuck to it. COMMENTS: We really like this soap for its bright white color and ease of use. Great price in the larger quantities. Works well with additional ingredients. Soft, soaps well. 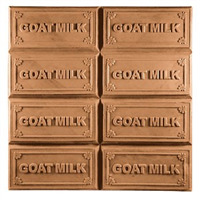 "Goat milk 24lb block "
COMMENTS: I had finally decided to save myself from endlessly ordering the small 2lb trays. Let me tell you, it was the best thing I ever did! If you use melt and pour on a regular basis this is the way to go. This is my favorite soap base, the goats milk is a creamy, beautiful lather. The product comes in a box and the soap itself its wrapped in a thick blue bag. At first I struggled to cut off what I needed but you will have no problem finding the tool that works best for you. I also noticed the soap was more sticky/moist than any I've had in the small trays but don't worry, it doesn't make any difference in your finished product. I highly recommend going big! COMMENTS: nice white color, lathers well, easy to work with, WIN WIN! COMMENTS: This is probably my favorite soap base I have found. Lather is amazing and soap holds scent very well. (we use EO blends) We used this soap base for over a year and our business has really expanded. Recently switched to the detergent free base. I would reccomend this soap! COMMENTS: Great base. Have bought multiple times and will continue to use it. COMMENTS: Love using this basic goat milk melt and pour base. The loaves are easy to unmold and do not sweat or discolor. This base produces a beautiful lather and feels moisturizing on the skin. It fragrances well, colors well and I love using this base. COMMENTS: I love this base. But, then again I love all the WSP bases I use. COMMENTS: This almost has me convinced to give up my goat's! Why am I doing all that extra work? Love my goat's. Love this WSP goat milk soap and so do my customers! Easy to use, easy to melt and set up and color and add embed and fragrance, etc. Had lots of fun with this one It did not sweat in my southeast Texas heat during our latest craft fair! Ordering again soon. Thanks WSP! "Basic MP Soap Base - Goat Milk 24 lb. Block "
COMMENTS: Lots of bars of soap can be made with this product and all at a great price, recommended to all!! "Great feel and quick to work with"
COMMENTS: Bought a 24 pound block and have made several batches in the last week. It melts great, takes fragrance well and pours like a dream. Will be buying more as soon as I run out of this order. COMMENTS: I like this base but think I like the premium better. I have never had a problem with either one of these soap bases. Both have a great lather and make your skin feel very nourished. Many great responses from customers. COMMENTS: I am a cp soaper not a mp soaper so I was surprised- really pleasantly surprised how nice this soap actually is. Great for quick projects or for a favorite fragrance that is too expensive, or too risky to use in standard CP or CPOP. COMMENTS: Once again I have found another product that I love and will be purchasing again! The size of the case is perfect, not too heavy either. 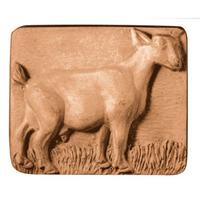 "Fabulous goat milk MP soap base"
COMMENTS: I love this goat milk MP soap base. The quality is much better than what I had been using. To make the soaps a bit snazzier I layer 2 or 3 complimentary colors. The soaps come out looking terrific. "This is the one "
COMMENTS: I love this stuff. Everyone that has gotten soap from me love this stuff. I will be ordering more soon. COMMENTS: Consistently great stuff...hold scent well, makes great soaps! COMMENTS: Love this base, I add extra coconut milk powder and it becomes the most creamy bar with rich, thick lather. I will definetly be using this base more often. COMMENTS: I love this base. Very creamy does not dry the skin out. 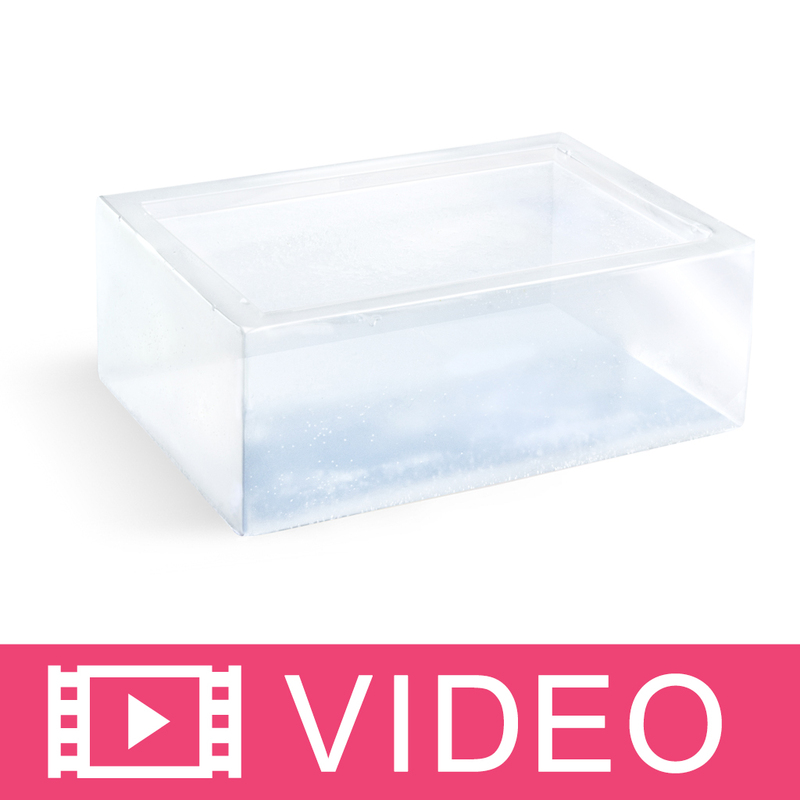 COMMENTS: This is a great basic base to use for your soaps - I always use it. COMMENTS: This is hands down my favorite base, creamy, great lather... sets up slowly but end result is fantastic. COMMENTS: This base accepts fragrances and additives so well. It lathers amazingly well and leaves the skin so soft. I enjoy working with this base and couldn't imagine being without it. COMMENTS: I really like this base. It has a lovely ivory/white color to it. It is easy to cut and mold. One thing I have noticed is that it is softer than some bases, but the end result is amazing! This base lathers nicely too! COMMENTS: I have chosen to go with this base after trying all of the goat milk bases. I think it has the best of them all rolled into one. Lathers nice, non drying to the skin, feels creamy. • Block broken into smaller amounts. COMMENTS: I love this base! I use it to make mp soaps and it doesn't sweat and lathers wonderful. it hold fo's and eo's well and is very moisturizing! COMMENTS: I like this base and always use it to make my products. Good quality. COMMENTS: If this is the basic, I can't wait to use the premium! Wonderfully creamy, white with a beautiful lather! • Nope, not a thing! COMMENTS: I love this product so much. I used to use body washes, but they left film on my skin. Once we decided to make a family business with soap making and I started researching and trying different brands, I knew that this would be the only brand we would be using. We give our products to family and friends to try and review for us. Everyone agrees that this is the best soap they have ever used. Not only does it hold scent excellent, but it lathers like nothing we've ever seen, and it lasts a long time in the shower. A bar of this soap lasts way longer than a bottle of commercial body wash, and leaves your skin feeling clean, soft, and comfortable. I would recommend this product to anyone that wants to use the best soap products on the market. COMMENTS: I bought this for my daughters sensitive skin. It works perfectly for her. She has no redness or breakouts! We love it!! COMMENTS: Product is easy to remove from box and plastic bag. Good quality soap! COMMENTS: My customers love this soap! I have had so many compliments on how soft it makes their skin feel. It holds fragrance and color very well. COMMENTS: I love this base--creamy, lots of lather and takes fragrance well. "EXCELLENT GOAT MILK MP BASE"
COMMENTS: It's exactly what the description on the soap says. I love the quality of the soap. I am very happy with their shipping. Gets here when it's supposed to and they package it well so it will not get damaged. • I liked the creamness of the soap. COMMENTS: I love the texture of this soap, it has a wonderful lather. "Can you please tell me the difference between this Basic Soap Base and the Premium Goat milk Soap base?" Staff Answer They are both very nice bases. The main difference is in the slightly different ingredients. The Basic Soap Base has a little less foam booster which actually helps this soap have bigger bubbles. This base is also slightly less expensive. The Premium base is slightly more creamy with extra lathering agents and considered our high-end bases. "I am currently adding coffee grounds to a m&p goats milk base from my local craft store. Although its not specifically suspension formula it holds them. Do you think this formula would react the same way? I have also used an all natural formula and they have all fallen to the bottom. " Staff Answer With any of our soap bases, if the soap is let to cool and thicken slightly after adding the coffee grounds, etc., it is more likely to suspend the ingredients. "I do not find the recommended fragrance amount for this base?" Staff Answer The recommended fragrance for this soap base is 3%. "Hi I am interested in purchasing the basic MP soap base- Goat Milk and was wondering if it is suspension formula?" "When purchasing 10 or 40 cases of the 24 lb. Blocks, is there a way to mix & match?" Staff Answer When you purchase 10 or more cases of soap, you are able to mix different cases of soap to receive the 10, 40 and full case volume discounts. All melt and pour soap bases can be included the mix and match. To receive mix and match pricing, you must telephone your order into our offices so that we can manually calculate and adjust the price. Our website cannot automatically make these price adjustments. Orders placed by internet cannot be later price adjusted. "What is the difference between this Basic MP Goat Milk Soap Base and the Goat Milk MP Soap Base besides price? Am I paying for a lesser quality product?" Staff Answer The Crafter's Choice Basic Goat Milk Soap has is excellent and a top performer in the industry. When compared to our traditional Goat's Milk Soap Base it has a lower percentage of synthetic detergents, which make big bubbles. To compensate and not sacrifice performance, we have enhanced the lather with saponified natural oils to make more of a creamy lather. Changing how and why the soap base lathers is what allows for the lower price.